I totally FAILED in getting a picture of this super yummy salad, but that might just tell you how delicious it tasted! It was gone before I could document it! You can eat this on its own, as a dip, wrapped in greens, or spread on your favorite sandwich. However you enjoy it, it is tasty, filling and energizing! I adapted this from two recipes, one at thekitchn.com and PostPunkKitchen.com, because they were so similar! Place Chickpeas into food processor and pulse until beans start to break down. Add all other ingredients and continue to pulse until well combined and the texture you like. Eat or store, and enjoy! 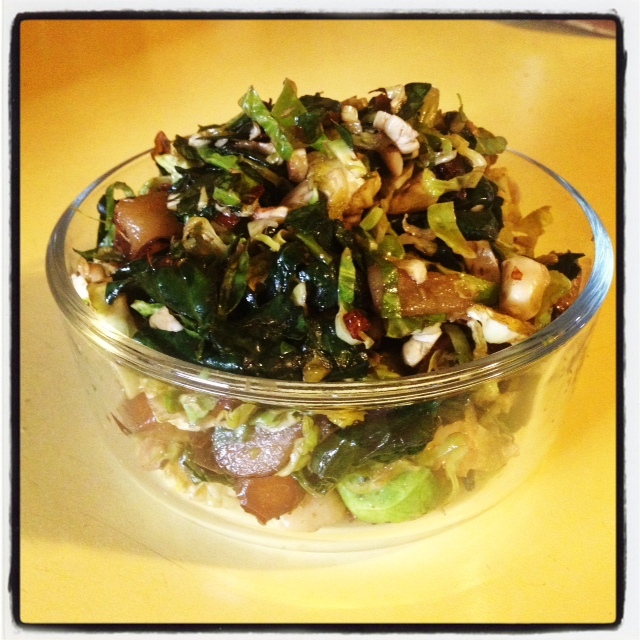 I ate this with other salads, on its own, and wrapped in kale! Shitake Mushrooms, pan fried (for tips see this recipe). 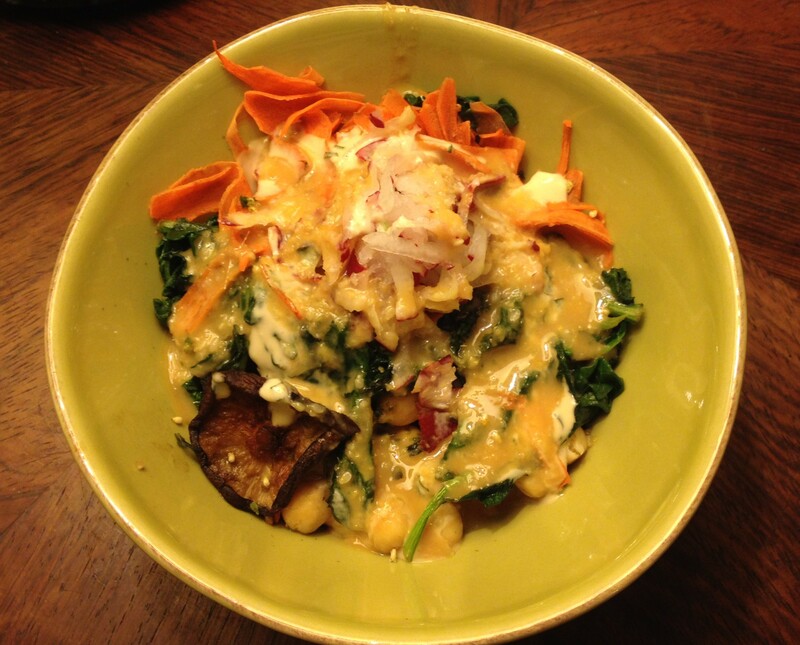 A macrobiotic bowl is a dietary staple of the macrobiotic diet which aims to create balance. 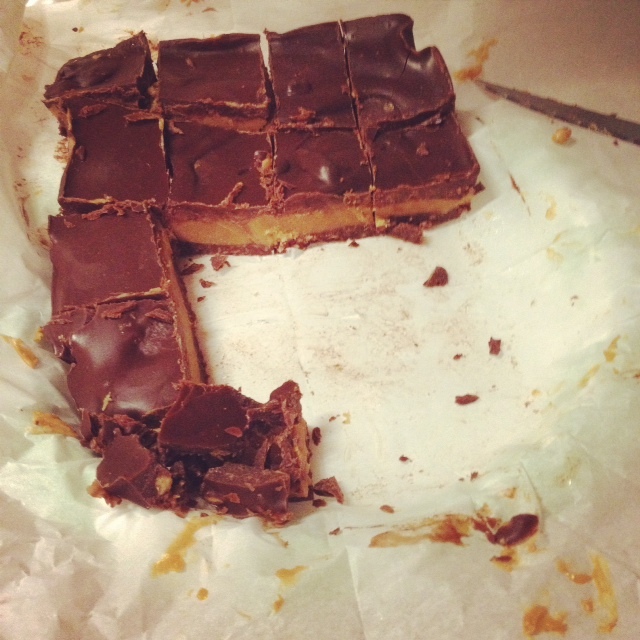 I am not going to go into the theory behind the diet but you can read more here. 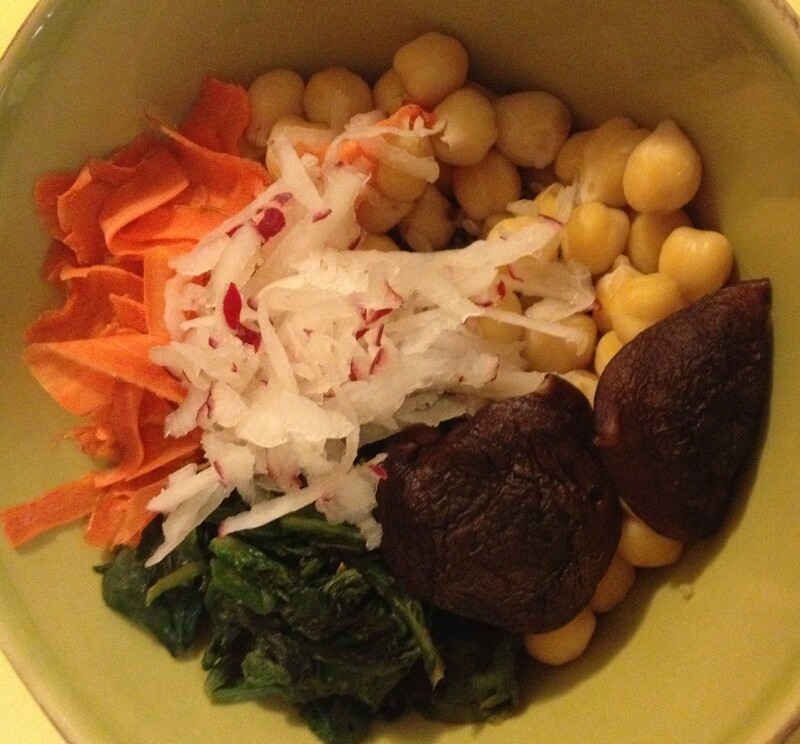 This is MY VERSION and may not be an accurate macrobiotic bowl as I did not include any fermented ingredients, which are a true component of a macrobiotic meal. I also did not use a ton of seaweed in this recipe (only with the chickpeas and as a condiment on top) so please do not treat this as a true macro dish. However it is vegan and does have the major components of a macro bowl: Greens, grains, & veggies so this is my variation upon the theme, and can really be made of any veggies, beans or grains that you like. I like ginger miso dressing, but lots of people prefer Tahini or simply Soy Sauce. I encourage you to do your research if you are new to this dish to see the creative possibilities! *I used dried beans instead of canned which are way healthier for you for so many reasons When using dried beans you need to let them soak in water for at least 12-24 hours, then drain them and boil. I boiled my chickpeas with kombu for added flavor and to infuse the seaweed’s nutrients into my chickpeas. *I cook my quinoa in veggie broth. The only difference from how you’d normally cook it is that I use broth instead of water, which adds a bit more flavor. *The more color the better! You know you’ve got a balanced macro platter when every color of the rainbow is represented! Fresh ground pepper and sea salt for taste. Pan fried mushrooms have a wonderful smoky woodsy taste that I wanted to infuse into my soup! Instead of washing my mushrooms I have started to wipe them clean with a damp paper towel, to reduce the overall amount of moisture they are exposed to (since they create so much of it on their own!). Once wiped clean, remove the stems from the shitakes and leave whole. 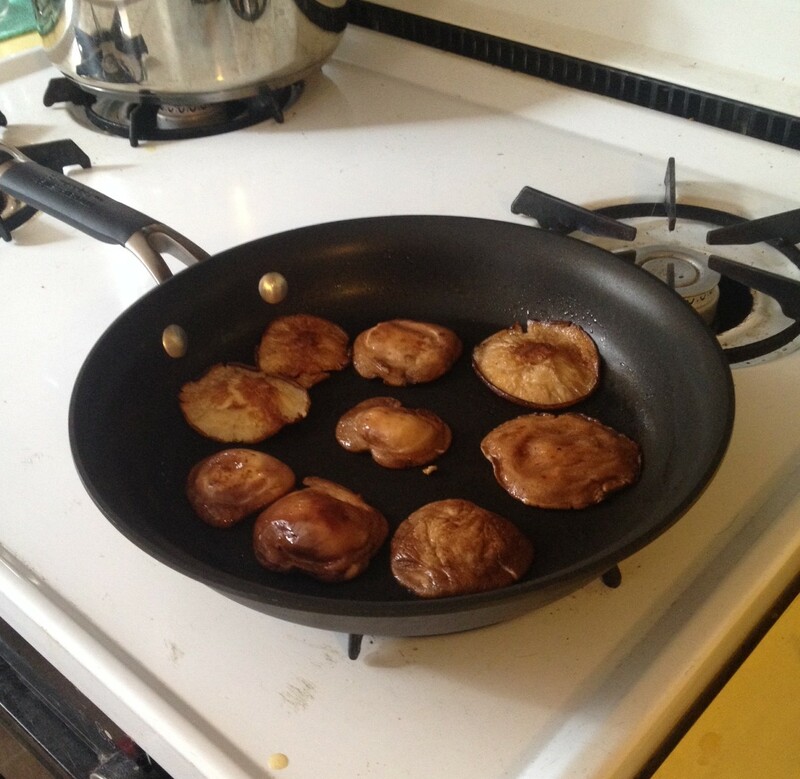 Slice the crimini’s (1/8-1/4 “) thickly so that they can be fried flatly, and proceed to cooking your shrooms. Now place a large pan on medium high heat and use butter or high heat oil to coat the bottom of the pan. Let the butter or oil heat and then place mushrooms in pan with a lot of room to sizzle. Cook mushrooms for 3-5 minutes on either side until they begin to carmelize and darken. Cook mushrooms in batches until they are all browned and tasty. Make sure the pan continues to have enough oil, and that you give all mushrooms enough room to cook properly. Take a minute to enjoy the aroma of all these lovely cooked mushrooms! After cooking let sit to cool and de grease on paper towels. Then either store for later cooking or chop up to prepare for soup making. Part 2: Make the soup! Place 1 tbsp butter or oil in the bottom of a large soup pot placed over medium medium heat. Once butter melts add Onion and Garlic and let cook for 3-5 minutes until aromatic. Then add Carrots and Celery and cook for another 5 minutes stirring to prevent sticking and to coat all veggies with butter. Once veggies start to cook through add mushrooms and cook for another 3 minutes. Then add broth and bring to a boil. Lower temperature to medium, add Kale and let soup simmer for 20-30 minutes covered. Once all veggies are cooked through soup is finished! Add salt and pepper to taste and serve! 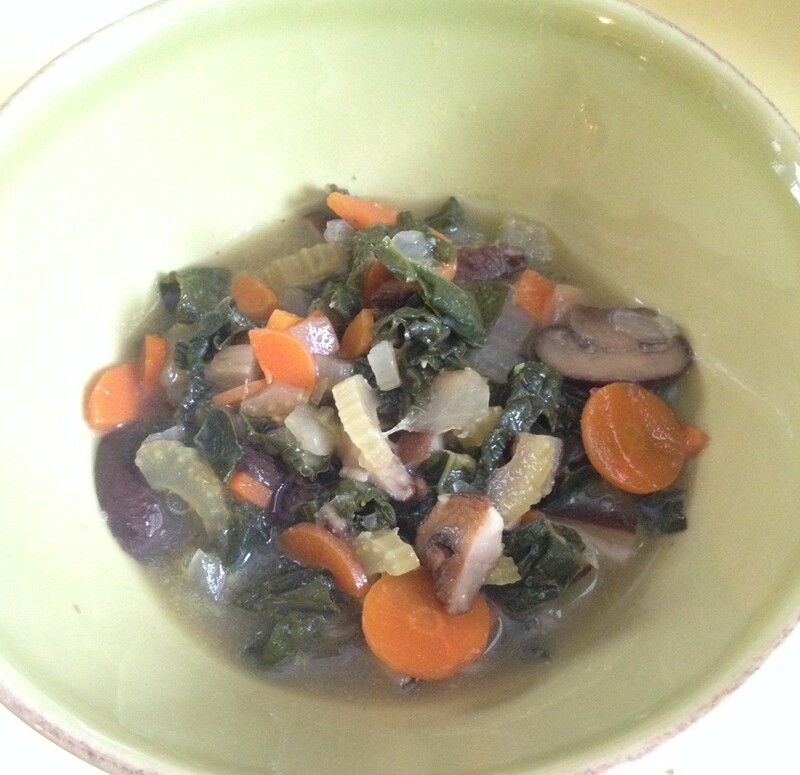 This soup has a savory and filling flavor while being light, detoxifying and so healthy! Yum. Step 1: Soak Cashews overnight in preparation. Step 2: Soak dried Shiitakes with 2 cups warm water in a small bowl and let sit for at least an hour. Do not drain, as the entire bowl will be added to soup! Step 3: Melt butter in a large pot over medium-low heat. Add Scallions and Garlic and saute for 3-5 minutes until fragrant. Add Cremini and fresh Shiitake mushrooms to pot and saute for another 3-5 minutes. Then add Carrots, Celery and Broccoli and Saute for an additional 7-10 minutes until all vegetables have started to cook through. Step 4: Add 4 cans of Broth, Shiitake water and rehydrated Shiitakes to the pot. Add seasonings and bring to a boil. Once boiling add drained Cashews and lower heat. Allow pot to simmer covered for 30 minutes to an hour. Everything is likely cooked through at this point, but if you prefer to let your flavors simmer longer, feel free to. Step 5: Once cooking is done, remove from heat and use immersion blender to puree. If you do not have an immersion blender, you can place your soup in a blender in batches to puree. You can probably also eat this soup as it is, although I would imagine that the soup tastes better with the Cashews as a part of the broth rather than in the soup… but you can do whatever you want! That’s the beauty of cooking, just because there is a recipe does not mean that you have to follow it! Get creative! Step 1 Wash and dry Kale. Remove the middle stem and rip into bite sized pieces. Place Kale in a large bowl and massage for 2-3 minutes until noticeably darker in color and softer in texture. Step 2 Toast Hazelnuts in toasted on light until slightly browned. Make sure to watch Hazelnuts as they toast as they can burn quickly. Once toasted chop roughly and add to bowl with Kale. Step 3 Add Cranberries, Brussels sprouts, chopped Pears to Kale and Hazelnuts and mix well. Step 4 Whisk Olive Oil and Vinegar together with Salt and Pepper. Then add to salad bowl and mix well so that all veggies are coated with dressing. Serve and Enjoy! So easy, simple, and yummy! I eat this as a side salad at dinner or for lunch and it lasts for a few days in the fridge. Step 1 Place nuts and dates in a food processor and pulse until well processed. Add all other ingredients and process until the mixture becomes dough like. Step 2 Roll dough into balls or cut into squares. For squares spread flat and even into the bottom of a pan, and allow to set for a few hours before cutting. I found that there was some excess liquid that I needed to allow to drain off and dry out overnight before serving. 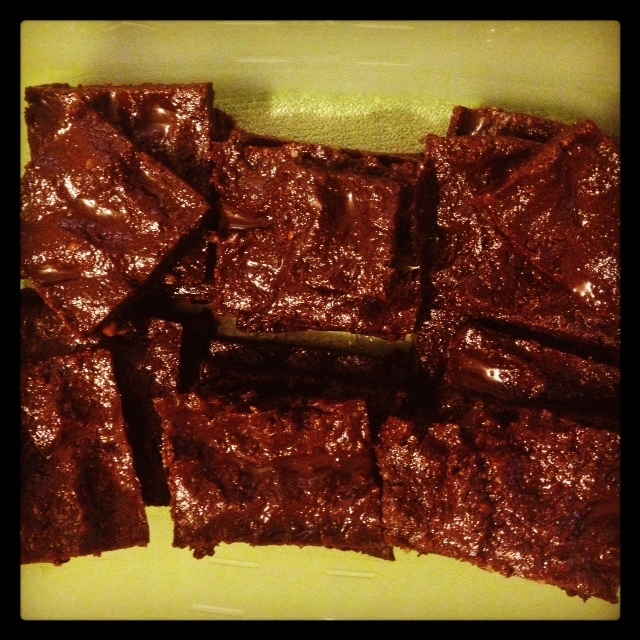 I coated the bottom of a rectangular baking pan with the brownie “dough” so that it could sit, solidify, and so I could remove the liquid. In the future I plan to play with the recipe to remove this liquid! Update: I just made these without the Coconut Oil and found that they were perfect in consistency and way less liquid-y. I also ended up using half raw honey and half maple syrup based upon what I had in my kitchen and it worked well, so substitute away… Up next raw ginger snaps!!! Lentil Soup for a Cold Winter Night! 1. Rinse lentils well in cold water and pick through to remove any stones, dirt or other debris. 2. Place in a large pot covered with 6 inches of water and add bay leaf. 4. Add Carrots, Celery, Leeks, Cumin, and Liquid Smoke (as well as any other spices you wish to get creative with! ), and cook for another 20-30 minutes partially covered until carrots are tender. 5. Add diced Tomatoes, Salt and Pepper and simmer at medium heat, partially covered, until lentils become creamy and soft, stirring to prevent sticking. 6. Remove bay leaf, add vinegar if you like, and serve with crusty bread! I love lentil soup and find it to be the most comforting thing on a cold night! 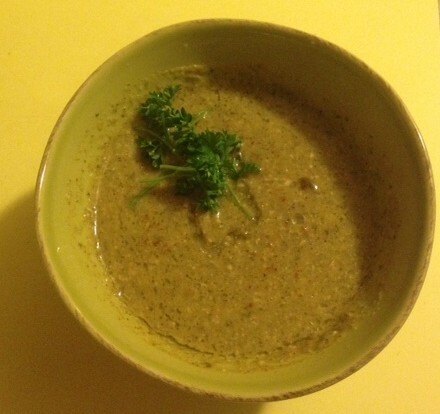 I failed again at photographing this soup so forgive me, but know that it is so tasty! Instead of sticking with what I like and am used to, this CSA is forcing me to try some new veggies in new ways. Some days I just want to keep it simple and so I have been adding all kinds of raw veggies to my daily lunch salad. I realized that this entire salad (except the cherry tomatoes which are organic) is from my Neighborhood Farms CSA share. Hooray for local, organic and delicious. 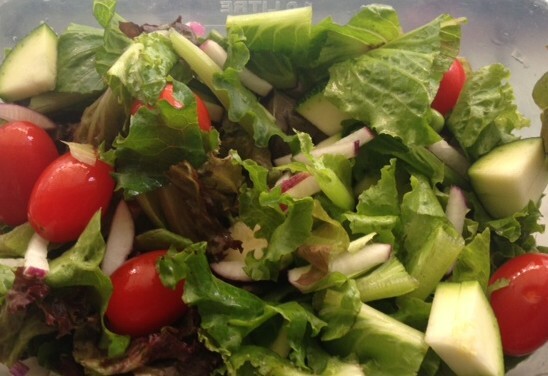 You can make a salad out of anything if the ingredients are fresh and of good quality! YUMMY, simple and easy (not to mention nutritious). use dressing of choice and enjoy!